A memorial concert paid tribute to the victims of the crash of flight 3407. 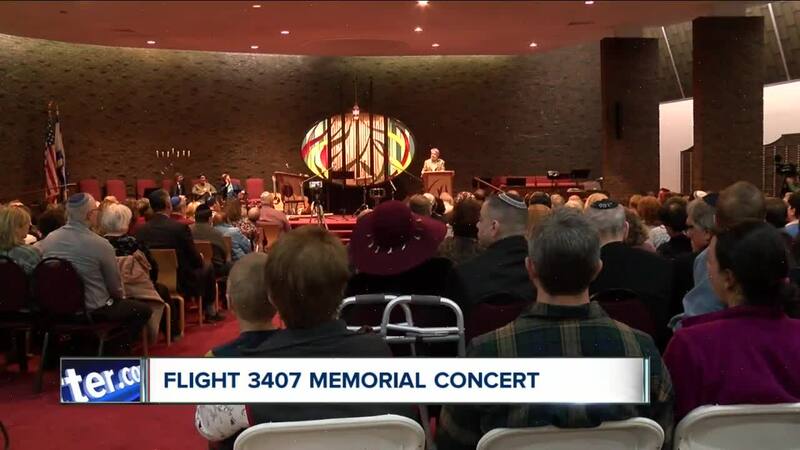 WILLIAMSVILLE, N.Y. (WKBW) — A memorial concert was held Saturday at the Congregation Shir Shalom in Williamsville to pay tribute to those that lost their lives in the crash of Flight 3407. This week marks 10 years since the crash, musicians, community leaders and cantors came together to celebrate the lives of those lost. "Tonight is not about grieving, tonight is about remembering them, tonight is about keeping memories alive and keeping legacies alive," said Bruce Corris President of Congregation Shir Shalom. We hope you'll join 7 Eyewitness News on Tuesday at 5:30 p.m. for Remembering Flight 3407: A Legacy of Hope. The special broadcast will remember the lives lost and track a decade of progress in advocating for tougher flight safety regulations in the U.S.
Join 7 Eyewitness News in remembering the lives lost in the crash of Flight 3407. Read more about their families' fight for safer skies in the decade since here.